A SpaceX Falcon 9 rocket launches a robotic Dragon cargo capsule toward the International Space Station on Feb. 19, 2017. This same Dragon is scheduled to launch toward the orbiting lab again on Dec. 5, 2018. 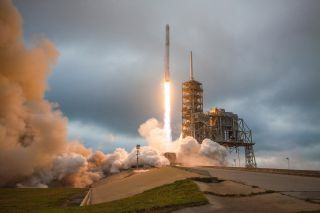 SpaceX's next resupply mission to the International Space Station has been pushed back to tomorrow (Dec. 5) due to a rodent problem. While technicians were getting a mouse experiment ready for loading onto SpaceX's robotic Dragon cargo capsule yesterday (Dec. 3), they found mold on some of the rodents' food bars, NASA officials said in a pre-launch news conference yesterday. You can watch the launch here at Space.com when the time comes, courtesy of NASA. Mother Nature should cooperate; there's just a 10 percent chance that bad weather will scuttle a Wednesday liftoff, launch weather officer Clay Flynn of the U.S. Air Force's 45th Space Wing said during yesterday's briefing. Forty mice are flying with the affected experiment, which is called Rodent Research-8 (RR-8). The project is designed to help researchers probe the mechanisms behind aging and age-related diseases. "Responses to spaceflight in humans and model organisms such as mice resemble certain aspects of accelerated aging," RR-8 team members wrote in a study description. "This investigation provides a better understanding of aging-related immune, bone, and muscle disease processes, which may lead to new therapies for use in space and on Earth." RR-8 is just one of many payloads packed aboard the Dragon for delivery to the orbiting lab. Other scientific gear includes the Robotic Refueling Mission 3, a technology demonstration designed to help pave the way for in-space satellite servicing, and the Global Ecosystem Dynamics Investigation, an instrument that will gauge forest-canopy height around the world. Dragon will also carry lots of food, spare parts and other supplies up to the station. The capsule is loaded with more than 5,600 lbs. (2,540 kilograms) of stuff in total, NASA officials said. This Dragon has one other International Space Station (ISS) mission under its belt: it launched toward the orbiting lab back in February 2017. That was the 10th ISS resupply flight SpaceX performed under its contract with NASA. Wednesday's launch will initiate mission number 16. SpaceX's Dragon cargo capsule, after it was fished out of the sea following the completion of its first resupply mission to the International Space Station in early 2017. The Dragon will take two days to reach the ISS, and it will stay attached to the orbiting lab for more than a month. The capsule is scheduled to return to Earth for a parachute-aided ocean splashdown in mid-January. The Dragon delay doesn't leave today launch-free. An Arianespace Ariane 5 rocket is scheduled to launch a communications satellite and a weather satellite from Kourou, French Guiana, at 3:37 p.m. EST (2037 GMT). You can watch that here at Space.com as well.